Louisiana Derby 2016 Features Mo Tom on Kentucky Derby Trail: The 103rd running of the Grade II TwinSpires.com Louisiana Derby offers a $1,000,000 purse, awards 170 Kentucky Derby points (split 100-40-20-10) and has attracted a field of 11 3-year-old colts to travel its 1 1/8 miles over Fair Grounds Race Course & Slots’ main track on Saturday, March 26. Won by the likes of Kentucky Derby winner Grindstone, Preakness Stakes winner Master Derby and Preakness and Belmont Stakes-romping champion 3-year-old Risen Star, the major Triple Crown trail prep has a distinct local flavor in 2016. Mo Tom With Corey Lanerie aboard, wins the Lecomte Stakes (Gr III) for three-year-olds, at the Fair Grounds Race Course, January 16, 2016 in New Orleans, LA. Owned by G M B Racing and trained by Tom Amoss, Mo Tom ran the 1 Mile 70 yard race in 1:43.18. Tom Amoss-conditioned Mo Tom, who will attempt to give his New Orleans native and 11-time Fair Grounds champion trainer his first victory in the track’s marquee event, flies the colors of the Benson Family of New Orleans Saints ownership’s G M B Racing and has been established as the 5-2 morning-line favorite. To be ridden by Corey Lanerie from post six, the son of Uncle Mo won the Grade III $200,000 Lecomte Stakes stylishly in January before a turbulent trip cost him any chance at victory last out in the Grade II $400,000 Risen Star Stakes. Since finishing third in that Feb. 20 event, the late-running $150,000 Keeneland yearling purchase has trained forwardly over the local surface, including a half-mile work on Mar. 5 in 47.80. The Bensons will not have to look far at the beginning of the race to see their rooting interests, as their Dallas Stewart-trained Tom’s Ready (15-1) breaks directly to the outside of Mo Tom in post seven under Brian Hernandez, Jr. Winless since breaking his maiden in late September, the son of More Than Ready has placed in a pair of stakes behind Mo Tom, including the Lecomte, and will look to improve upon a seventh-place finish last out in the Risen Star. 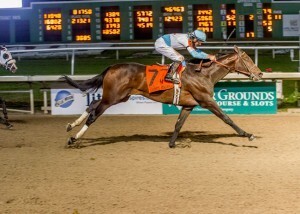 Another of Louisiana’s prominent families will be represented in the Pelican State’s premier horse race with a serious contender in Evelyn Benoit’s – who races as Brittlyn Stable – Forevamo (10-1), from the barn of New Orleans native and Breeders’ Cup Classic-winning conditioner Al Stall, Jr. Drawing the outside post 11, the son of Uncle Mo will try to do one better than his runner-up finish in the Risen Star, while continuing the upward trajectory of his last few efforts. Louisiana native Colby Hernandez, currently second in the local standings, has the mount. 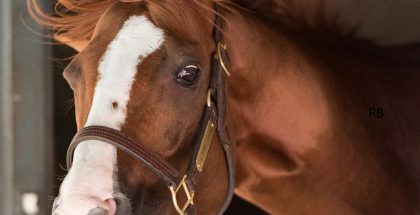 Winchell Thoroughbreds and Three Chimneys Farm’s Gun Runner – second choice at 3-1 on the morning line – also has improved with each start for trainer Steve Asmussen, including a win last out in the Risen Star to kick off his sophomore campaign. The good-looking chestnut son of Candy Ride signaled his readiness with a bullet five-furlong move in 1:00.60 on Mar. 14 and will be ridden once again by meet-leading jockey Florent Geroux from the rail. St. Elias Stable and MeB Racing Stables’ Dominick Schettino-trained Greenpointcrusader, the beaten lukewarm favorite two back in the Grade I $2,000,000 Breeders’ Cup Juvenile, leads a three-pronged ship-in attack from South Florida. An easy winner of the Grade I $500,000 Champagne Stakes as a juvenile, the classy son of Bernardini has not raced since kicking off his campaign on Jan. 30 with a game second to divisional co-leader Mohaymen in the Grade II $350,000 Holy Bull Stakes. Hall of Fame jockey John Velazquez has the mount from the two-hole on the 7-2 morning-line third choice. Harrell Ventures’ Todd Pletcher-trained Battery (10-1) and Kenneth and Sarah Ramsey’s Mike Maker-trained Uncle Walter (20-1) – whose conditioners have collectively won four of the last six Louisiana Derbies – must be taken seriously in this spot. Battery, a son of Bernardini, is the only contestant with a race and victory over the nine-furlong trip, doing so last out in allowance company at Gulfstream Park. Javier Castellano retains the mount on the improving sort from post three. Uncle Walter showed promise when third in the Lecomte, beaten only three lengths in his third lifetime start. Beaten more than 40 lengths to last in the Risen Star, in what is presumed a non-effort, the bay colt quelled any doubts of his connections with a bullet five-furlong work on Mar. 15 in 1:00.60 at his Gulfstream base. Robby Albarado picks up the mount from post eight. Invading from the north will be the Oaklawn Park-based duo of Steve Landers Racing’s Brad Cox-trained Dazzling Gem (12-1) and Conquest Stables’ Mark Casse-conditioned Conquest Windycity (15-1). Dazzling Gem was slated to compete in the Grade II $900,000 Rebel Stakes on Mar. 19, but missed a work with a minor foot abscess and returned to the tab on Mar. 15 with a bullet five-furlong drill in 1:00.60 in advance of his contingency excursion to New Orleans. Raced only twice, the bay colt won both events in two-turn Oaklawn trials and has shown improvement for a barn that is batting 35% at the Fair Grounds meet. Shaun Bridgmohan, who flew up from his Fair Grounds base to ride Dazzling Gem in each of his wins, reconnects with him on his home oval from post nine. Conquest Windycity was an $800,000 OBS March 2015 purchase who hails from a stamina-rich family and races from the same barn as beaten Risen Star favorite Airoforce. By Tiznow out of a full-sister to Grade II winner Jump Start, the dark bay colt was a visually pleasing winner over Grade I-placed Rated R Superstar in a one-mile Oaklawn allowance last out. Since that Feb. 19 run, the promising winner of his last two has worked a pair of bullets at said Hot Springs track, including a five-furlong move in 59.80 on Mar. 5. Joe Rocco, Jr., who was aboard for his victory last out, rides again from post four. Rounding out the Louisiana Derby is a pair of Risen Star also-rans who have each shown vast improvement since turning three. Frank Mancari’s Roger Brueggemann-trained Candy My Boy (15-1) broke from the outside post 11 in said Feb. 20 event and set a wicked tempo before giving in begrudgingly to lose by 2¼ lengths in fourth. 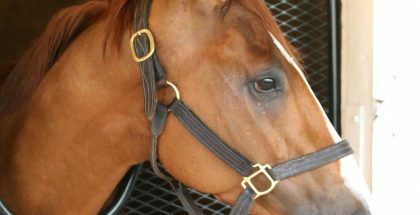 A speedy two-time meet winner who broke his maiden three back on New Year’s Eve over well-regarded Creator and returned 18 days later to defeat Forevamo in allowance company, the son of Candy Ride hails from a barn that has struck at 27% during the meet and won three of its previous 10 attempts in graded stakes. Francisco Torres, who was aboard for his Jan. 18 allowance victory, returns to ride from post five. Lloyd Madison Farms’ Zapperini (20-1) closed from last in the Risen Star to finish fifth of 11, beaten 9¾ lengths at odds of 47-1. One of only four competitors with a victory over the surface, the lightly raced son of Ghostzapper won a two-turn Fair Grounds maiden one race prior on Jan. 21 before stepping up considerably in class in the Risen Star for trainer Greg Foley. Julien Leparoux picks up the mount from post 10. 11 Forevamo 10-1 Hernandez/Stall, Jr.